Trick or Treat–Here’s the Treat! 10 Ways to Save On Your Power Bill! Unplug appliances and electronics. TV’s, computers & kitchen appliances, as well as cell phone and laptop chargers, all use energy when they are plugged in even if they are turned off. Use power strips. Power strips automatically turn off when electronics are off or when one main unit (like your personal computer) is powered down. Turn off the lights. When you’re not in the room or not in the house, there’s no need for all the lights to be on. CLEAN AND REPLACE AIR CONDITIONING FILTERS AND FURNACE FILTERS! Dirty filters block air flow, increase your power bill and shorten equipment life. In the warmer months, keep the shades and blinds closed down on the south, east and west facing windows. In colder months, open them up and let the warmth of the sunshine in. Active “sleep” features on your computer and office equipment. When they go unused for a long period of time, they power down. During our Las Vegas heat (which I hope is almost over) raises the thermostat. Wear light clothing. During colder months, lower the thermostat. Dress warm and just put an extra blanket on the bed at night and be cozy. Use ceiling fans instead of air conditioning when possible or combine their use to turn down the air temperature a bit. Wash your laundry with cold water–it’s just as effective. 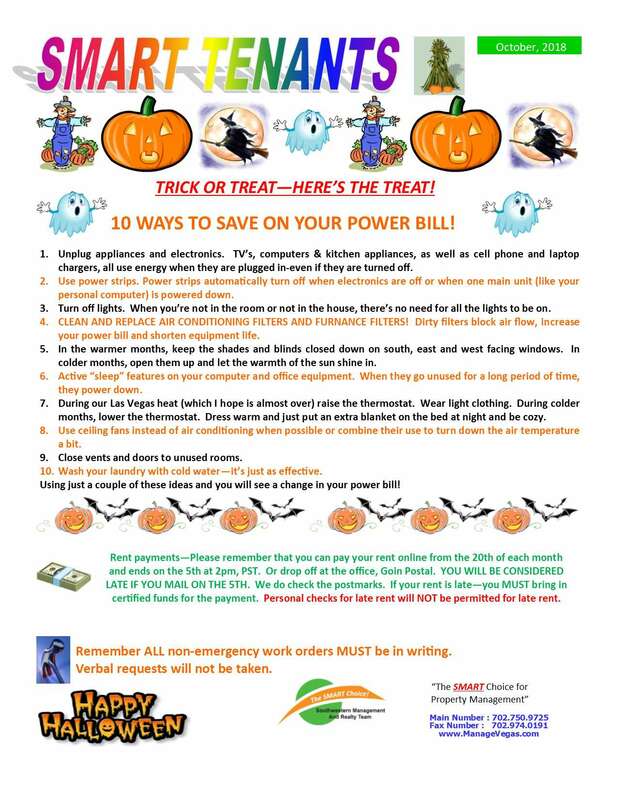 Using just a couple of these ideas and you will see a change in your power bill! Rent payments– Please remember that you can pay your rent online from the 20th of each month and ends on the 5th at 2 pm, PST. Or drop off at the office, Goin Postal. YOU WILL BE CONSIDERED LATE IF YOU MAIL ON THE 5TH. We do check the postmarks. If your rent is late–you MUST bring in certified funds for the payment. Personal checks for late rent will NOT be permitted for late rent. Remember ALL non-emergency work orders MUST be in writing. Verbal requests will not be taken.